We are a small fun-loving pack located in Northeast Wisconsin. Bailey, sporting his signature "Airplane Ears"
I have been working with dogs since 1997. I started by working at a boarding kennel and by training friends' dogs because my parents wouldn't let me have my own. I soon became involved with a program that trained service dogs for people with disabilities and convinced my parents to let me bring home a dog for "in home socialization" on occasion. One dog in particular stole my Mom's heart. His shyness and lack of socialization was clearly something that eliminated him from being used in the program and he needed a "pet" home. I did what was possibly both the most foolish, life altering, and rewarding thing I've ever done and decided to bring him home in 1999 just before I graduated from high school. Read more about Bailey, the dog who changed everything, by clicking on his his picture. Blue. One of my favorite dogs out at Field of Dreams. In the summer of 1999 I lucked into an amazing opportunity. I was offered a job at Field of Dreams Kennels to help start up their new boarding facility "Country Home Bed and Biscuit". The scenery was wonderful and I learned more than I could have imagined. On only my third day of work I assisted in whelping a litter of 13 puppies and many litters followed. I did some basic obedience training and dabbled in some field work while I was there. The only down-side of the job was the occasional bag of slimy dead birds from the night before that I "got" to use for training in the mornings. A few years later I worked for a local veterinary clinic as the kennel attendant. I was very fortunate to be given the opportunity to work with the technicians and doctors in the treatment area. I was able to observe many surgical procedures, particularly in orthopedics, by volunteering to be the surgical go-fer and instrument opener. Over the course of my time at the clinic I learned a great deal about veterinary medicine. I particularly enjoyed the opportunity to work with surgical recovery patients in a hydrotherapy tank. Only once did I come across the chance to assist in whelping a litter of puppies at the clinic, but it became clear to me that my experience at Field of Dreams was very valuable. I also discovered that pursuing a career in veterinary medicine, while fascinating, was not the path for me. Cain. May he rest in peace. In my "young and dumb" early 20's I co-owned a Rottweiler puppy named Cain with my boyfriend at the time. Cain's mother was in season when my boyfriend's friend bought her and the foolish decision was made by her purchaser to breed her to the dog of another friend. The dog she was bred to, I later found out, was bilaterally severely dysplastic. I have yet to see another hip x-ray as bad as those of Cain's sire. Cain was a fantastically sweet puppy. Easy to train, eager to please, and my first chance to test out my puppy picking skills. I had to make the awful decision to put Cain down at only 8 months of age because both his hips and shoulders were already causing him to suffer. I still wonder what became of his litter mates and I hope that if they fell victim to the same fate Cain did, their owners made the best decisions they could for them. Cain has a huge influence on both my breeding philosophy as well as my overall dog philosophy. Simply put, dogs deserve better than the life Cain was dealt and I strive to be a part of making that happen, above all else. In the summer of 2008 I decided Bailey and I should find a little girl to add to our family. I hit the jackpot when I found Lilly available at Furry Bottoms rescue. Bailey approved of her immediately. Lilly was a shy, spooky girl with an outgoing spunky spirit just dying to get out. A few minutes with her and I knew she was perfect for us. A few minutes with us and it was clear she finally found somebody she felt she could trust. Lilly's leash was in my shaking hands the first time I ever entered a show ring and we hope to collect a few more Rally ribbons before we call it a career. Read more about Lilly by clicking on her name above. The more I learn about dogs the more I realize that the most important thing to me when it comes to my dogs is health. I love my rescues with all my heart, but they have paid dearly for their genetic shortfalls. Bailey suffered from hip, knee, and back pain and Lilly, at only about 5 years of age, already showed signs of sore shoulders after a run due to her unbalanced structure. Lilly won't get to compete in agility because I can't bear to see her in pain down the road from it. Cain's life was cut short because his "breeder" chose a puppy paycheck over doing right by the dogs. It simply doesn't have to be this way. There is something I can do to produce, and share my life with, healthy structurally sound dogs. This is the reason I made the choice in 2011 to enter the realm of purebred dogs - dogs of known genetic lineage, traceable structure, and tested genetic health. I made the choice to do better, and I always will. For me, ethical breeding is supremely about health - breeding structurally sound dogs with proper temperaments and longevity is not only the right thing to do for the dogs, but for the owners who love them and never want to see them suffer. Sharing my life with a dog who can live without pain or genetic disease until the day he dies at a ripe old age as a result of sound structure and good genetics is my ultimate goal. "Pretty" is simply not a deciding factor for me, only a bonus. 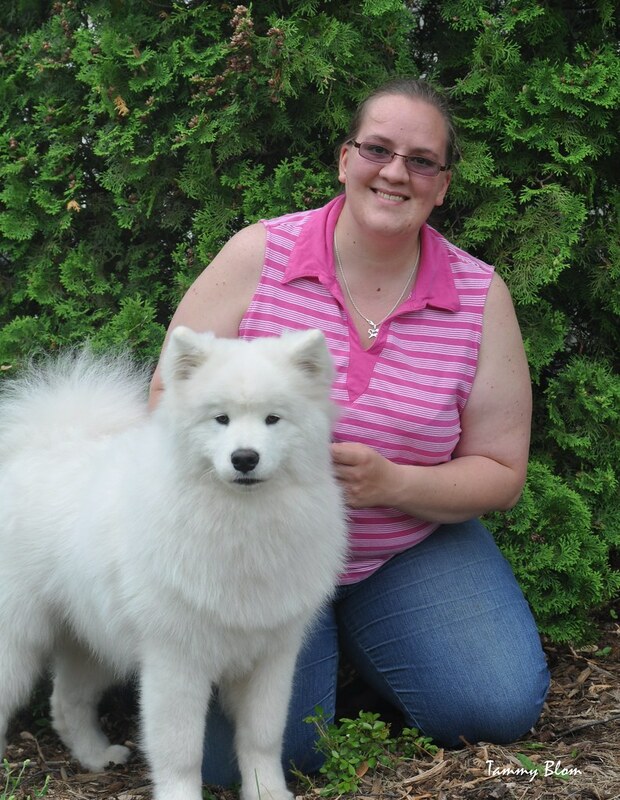 While many fall in love with the Samoyed for his beautiful coat, I fell in love in spite of it. I'd be a liar if I said the coat didn't scare me. But, the effortless movement of these sturdy, versatile, and athletic dogs took hold of me almost immediately. Then, their wonderful dispositions and smiling faces went to work on my heart. I find them to be truly out of the arctic and into our hearts. I sincerely hope that the original purposes of the breed are never forgotten. The grooming, I have discovered, is completely worth it (and with the right training, rather enjoyable). My journey into the world of purebred dogs begins with Mendel. Aptly named after Gregor Mendel, the "Father of Genetic", he marks the beginning of what I have no doubt will continue to be a most amazing adventure. Learn more about Mendel by clicking on his name above. 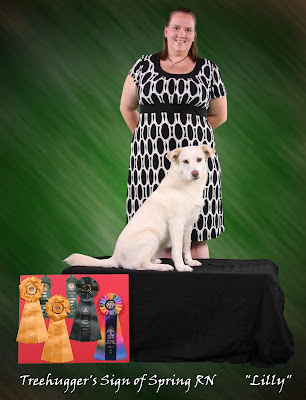 In 2013 I co-bred and helped raise my first litter of puppies, whom my Mendel sired - 4 girls. I was very fortunate to build a friendship with the owner of two of those sweet girls (Synnie & Mars), and 2 years later I showed Synnie to my very first Bred-By Championship. On March 9, 2016 my world changed again with the arrival of Synnie's Project Mercury litter, and my sweet baby Fly. Both Fly and his brother Polo drive forward our breeding program and continue to show me more and more wonderful things to love about healthy purebred dogs. I hope that by reading my "life in dogs" story you can get a feel for who I am as a breeder/owner and why I place such huge importance on things such as health testing. If you buy a dog from me, both you and that dog will always be a part of my family, and you will have become a part of my sincere effort to ALWAYS produce health companions. There will be things you will ask of me, and there will be very important things I will ask of you - we are in it together, and even as a "just a pet" owner you will become a very important part of my life in dogs. There have been owners who came before you that played on our team so that I had the ability to produce the amazing puppy you will take home with you, and there will be owners who will come after you who will have you and your efforts to thank one day, as well. Ms. Rosalind Franklin was a brilliant scientist of the 1950's at King's College in London who's work contributed to the discovery of DNA's double helix. 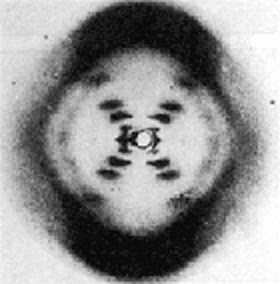 She created x-ray diffraction images referred to by one of her peers as "amongst the most beautiful x-ray photographs of any substance ever taken". An image of DNA she created was seen by Watson and Crick (the two men more commonly credited with the discovery of the double helix) and used to form their hypotheses regarding the helitical shape of DNA. They published their findings without properly crediting her, and much like other female scientist of that time, she was never given fair credit for her work. We may not be a ground-breaking kennel in the grand scheme of things, but life with Samoyeds sure has proven to be life altering for me! I love the boys. Always have. It's entirely possible that boys are all I will ever own. The lifestyle I choose for my dogs and myself, while excellent for my pack's development and happiness, is not always conducive to raising puppies. This is one reason I will always push so hard for transparency in health matters in our breed. If I can't produce my own puppies, it is supremely important to me that I can trust those from whom I buy or agree to allow the use of my dogs for stud. There is no honor in hiding from the truth and there is no true benefit to keeping secrets. If we are to succeed, we will do it together. If we are to fail, we will do it alone and as a result of vindictiveness and distrust. First and foremost, a good breeder is supremely focused on her dogs as companions and individuals. She does not see them as walking pedigrees, puppy factories, machines, children's toys, or lawn ornaments. When a breeder produces a litter of puppies, her primary focus is on providing those puppies she cannot keep with the absolute best homes she can. Ultimately, a good breeder does not breed for the purpose of having happy customers, and she does not keep a policy of "the customer is always right". Certainly she wants her buyers to be happy because quite often happy buyers = happy puppies. But, when the chips are down, a good breeder will fight with everything she has to protect the health and safety of her dogs/puppies over ensuring her customers remain satisfied. This should never be taken for snobbery or for a breeder being "too picky" - a breeder being absolutely sure about who she places her dogs with and being a little "over the top" about what she requires is how she stays supremely focused on her dogs as companions and individuals. Next to the importance she places on each puppy as an individual, a good breeder is always focused on the part that puppy plays in both his genetic lineage and the part that lineage plays in her kennel as well as the overall breed. All good breeders are part of an orchestra. Each of the dogs she chooses to breed are violinists (for example) in the orchestra and she runs the violin section to the very best of her ability so as to ensure the entire orchestra can succeed. She works with friends and their kennels to maintain an outstanding string section. She knows that while she is extremely proud of her violinists and the string section, the ultimate goal is to be an outstanding contributor to the entire orchestra. Should a buyer decide to take on a puppy the breeder wishes to use in her breeding program, they must never forget they have become a part of the orchestra themselves. A good breeder values the opinions of the entire orchestra. Certainly there will always be breeders that disagree with each other, but in the end a good breeder doesn't just assume they are the only one who knows anything about anything. A good breeder will not suggest that the opposing opinions of other breeders are simply a result of ignorance. Breeders who feel they know everything and don't need or value the input of others do themselves, their dogs, and their buyers a great disservice. Integrity is integrity. You either have it, or you don't. ALL contracts should be read completely and all agreements should include contracts. THINK before you sign. Buyer, breeder, stud owner... doesn't matter. If you sign a contract, there is no taking it back or changing your mind.